Stretching out to the World! What an exciting time to stretch out to the world! An analyst for non-profits asked me this question about BFF: What would you do if you had a substantial increase of financial support? Well, you probably know that BFF has been financially challenged for these 15 years. We have not been able to take even one step at a time but only quarter or half steps, prayerfully moving forward. Our pledge is to never go into debt. From 2000, when I put up our very first web page until now, God has provided for us (even with eight children!). So I had to think a lot about this question! So we were so excited when God recently graciously released funding for translation work. With a little extra income it is amazing to see what can happen! Right now there are six translations in process, with one more in the works! The translators that I work with are so dedicated. I am so grateful for their devotion and commitment, often working after their regular hours. One translator has no computer or even a smartphone, but can wait close to an hour in line at an internet cafe so he can translate. They are willing to endure such hardships partly because they see the value of the book itself. The Spanish translation of “The Life Core” is almost completed and waiting for formatting on my desktop. 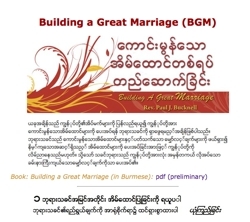 One brother, head of a discipleship training school, in the far north of Myanmar (Burma), heard of our marriage seminar and requested me again to come and teach them. I couldn’t make it, but he was so grateful that I could send him a copy of our recent Burmese book. 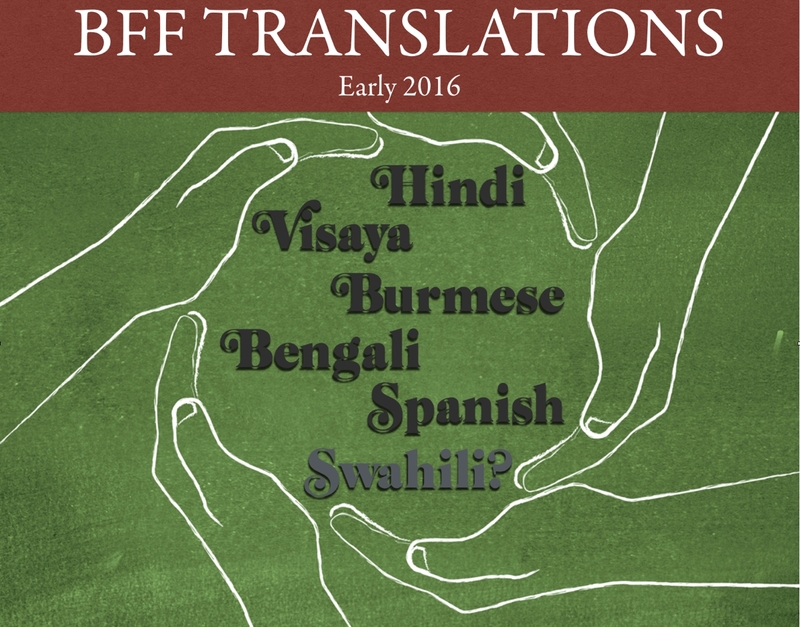 When there are hardly any good Biblical resources to be found in these languages, BFF books are worth their weight in gold. We are now in the midst of arranging for a trip to Kenya in April. Do pray for the many details that go into planning one seminar, let alone several of them on a trip. Do pray for Rev. Matthew, the coordinator helping me, as he organizes the schedules for this trip. My goal is to get at least one seminar translated into Swahili, though my real hope is for several. Kenya is one of the countries dealing with terrorists sneaking in and causing trouble. May the faith of the millions of Christian believers grow strong during these days. The last time I went and taught the D1 “Initiating Spiritual Growth in the Church” seminar translated into Swahili, the Spirit powerfully used some lessons to heal the wounds from the feuds between various large tribal groups which had crept into the church. Today, our world scene has totally changed with different challenges looming on the horizon. We are so grateful to those who gave gifts enabling us to receive 100% level of salary (first time?)! I am very happy with the progress on many articles recently updated or written. Thankful for good brothers to work with from around the world doing these translations! Pray for Jan 24 as I co-teach with Mike and Jan 31 as I preach. Pray for extra help on the homeside for getting the translated work finished and properly posted, as well as other new resources that are always being worked on. For every one article I publish, I have about five (about 5-10 pages long) that await that final editing. Pray for our travels and refreshment as we visit supporters and refresh ourselves in Florida’s sun in early February. I hope to use part of that time to focus on writing new books. 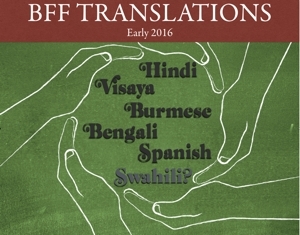 Pray for insight, strength and wisdom from the Spirit for BFF’s translators and editors. Pray for guidance, planning and funding for the upcoming Kenya’s trip. Pray for wisdom for Rev. Matthew. Like many places I go, there are tremendous needs among the people. Poverty and hunger strikes hard these days in Africa.